I recommend the wiki page at gundam.wikia.com for a vast in-depth information about the mobile suit Rising Gundam. click the gundam wiki logo image on the right to take you there. 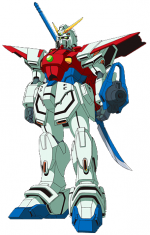 Originally created during the development of Neo Japan's Shining Gundam, the Rising Gundam is sent to Earth not to compete in the Gundam Fight, but to battle the sinister Devil Gundam. Redesigned for real warfare instead of dueling, this mobile fighter is equipped with practical weapons like a long-range beam bow and a polearm-style heat naginata. The Rising Gundam can also be converted to an aggressive Mobility Mode, in which its shoulder armor becomes a protective shield.